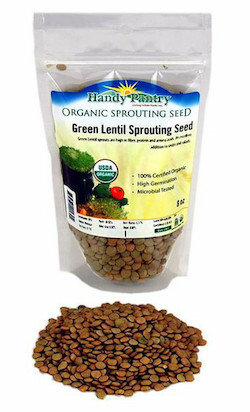 These dried green lentil sprouting seeds are common green lentils and are delicious, crunchy, high protein sprouts. They can be used for soups, cooking, and emergency food storage. Directions: Soak eight hours, rinse and drain. Spread evenly in sprouter. Rinse sprouts two to three times per day for three or four days. Do not expose lentil sprouts to sunlight unless you want them to develop chlorophyll. Ingredients: certified organic green lentil sprouting seeds.